Today, I’m going to talk about my experiences through the theme of “Skill Share” in three countries; Cambodia, Japan and Malawi. First, I’ll start with the case study of Cambodia. This is brief Cambodian film history we have to know before knowing the status of film archiving in Cambodia. From the late 1950s, Cambodian filmmakers started to make films. But in 1975, Phnom Penh was fallen by Khmer Rouge and execute intellectual persons including all film makers, actors and actresses. Until then, Cambodian films were produced more than 300 titles which is called Golden Age of Cambodian Film. However, many of the films have lost at home and abroad during the long civil conflict which continued until 1993. Now, approximately 10% of titles is survived as copied VCD or VHS which means very low quality. After the genocide of Khmer Rouge, in 1979, Cambodian government collected some films survived in Cambodia. 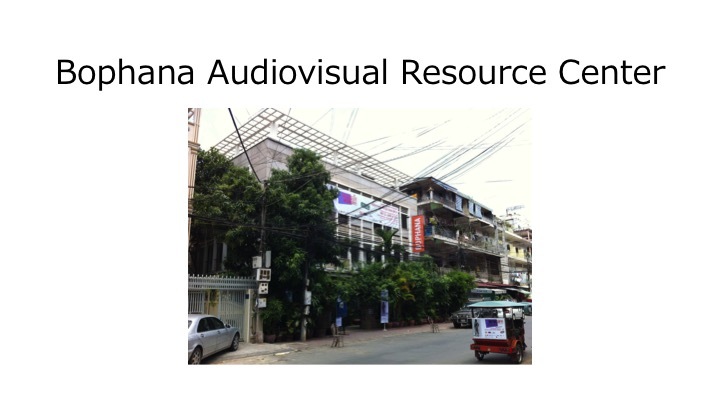 I worked at Bophana audio visual resource center as an AV archivist from 2014 to 2015 financially supported by Japanese government. Because there is no any professional can handle films in Cambodia, even though Cambodian government has a lot of AV collections. These pictures were shot in 2014. And these are shot in 2015. The building is different, because Cambodian government threw away a lot of films, I suppose a few thousand films. And, remains were sent to the new building. My first work in Cambodia is counting this national AV collections. From 2014, I started skill share with Bophana staffs as one of my works. I shared to them how to handle and inspect films. My activity at Bopana Center got on the cover of FIAF journal. Right picture, He is Narie as skill sharing. He is an IT assistant manager, not an archivist. So, this picture is just a photo session, unfortunately he no longer continuing this work. Because Cambodia Government as well as Bophana center does not have enough budget for employment for film inspection. Even though I shared many kinds of skills with them, it is hard for Bopana Center to keep staff for film archiving. As far as we inspected 700 films, around 80% is Cambodian film, but around 25% of them are bad condition. For example, we found some rare films in the collection. These are important film collection for Cambodia. But film archiving work does not proceed, even though skill share was done. Frist, no one wants to touch stinky and disgusting smelled films without being paid. Second, there is no “JOB” in Cambodia after studying film archiving. It is important to share the skills, but also it is very important to get position to employ staff and budget to preserve films. This is what I understand through my experiences in Cambodia. Next case study is Japan. There was a big earthquake in North-East of Japan in March 11th, 2011. It caused around 16 thousands deaths, and around 30 thousands are still living in the temporary houses even now. 4 days after the disaster, Film preservation society, Tokyo and I started “Film Salvation Project”. The aim of the project was salvaging films and videotapes, and then stabilizing and digitizing them. Large numbers of salvation projects for photograhy were founded in Japan. However, there was no organization except film preservation society, Tokyo that salvages films and videotapes from disaster. We are the only one organization until now in Japan. So, we decided to start skill share of how to treat the materials or how to stabilize and digitize them. In Japan, generally technicians tend to keep their restoring technique undisclosed. It’s because if other people start to do same technique, they might lose their job. But in emergency cases, such as natural disaster, we cannot say that. Skill share can be the most meaningful and effective at the time of natural disaster. Film salvation project uploaded basic first-aid treatment of water damage. We have 2 versions, one for 8mm films, and the other is for video tapes. We also still continue skill share workshop once a year. In the workshop, we prepare films and video tapes which are purposely damaged by water and sand, and then, we do the basic first-aid treatment, cleaning and drying, and also practice how to digitize them. The participants of the workshop are mostly from film and/or video industry. This skill share is still on the half way, it’s not perfectly widespread in Japan. But at least, professionals of other genres, such as historian, begin to recognize and share the skill that it is able to salvage damaged films and videotapes. I’m based in Japan, so I’m still conducting this project as a leader. In another word, I have a “position” in this project. So, this project keeps going well. The Last case study is Malawi. My first visit to Malawi was in 2016. I went to there to research audiovisual collections of NAM, the National Archive of Malawi. Fortunately, from last year, film preservation project has founded by NAM, and Tokyo Koon, Japanese private company I work now and financially supported by Rei foundation. Malawi is a small country inlying of Southern Africa, and one of the poorest countries in the world. Malawi became independent from England in 1964. This is the main building of National archives of Malawi. Some British and Malawian produced films from 1950s to 1970s and some of them are left near restroom in NAM. Most of their film collection are news reels, so there might be the same films in England, but we don’t know yet. Because we don’t have the cataloging data of the film collection now. As far as I inspect 100 films, around half is not bad condition, and the other half is bad condition. Around 5% of the films are melting as you can see the bottom-right picture. I would like to just mention that NAM also has sound open reels which were recorded from 1950s to 1970s. They are speeches of Malawian politicians and traditional songs and music. My position in this project is the consultant of audiovisual archiving for NAM and Rei foundation. So, I set out 3 phases briefly in this project. 1 is Preservation. 2 is Inspection and Digitization. 3 is Access. The first phase of this project was to find a storage suitable for films and then install air- conditioner and shelves. After that, we will carry films into the storage. and now we are in the second phase which is inspecting all films and digitizing all good condition films by a film projector. The guy, Bright is the conservator of NAM and works practically for this project. As a consultant, this month I went to Malawi with all equipments from Japan, as you can see in these pictures, film rewinders, film projector, movie camera, light box, iMac and so on. And of cause, I shared my skills as much as possible to inspect and digitize films with working together for two weeks. Supported by Rei Foundation, Bright has attended FIAF summer school twice, in Italy and in South Africa. So, he already knows basic theory of film preservation and restoration. Through the experiences, he keeps his position as the conservator of Audiovisual collection at NAM. This project is going quite well. In Malawi, power outage happens very often. So, we bought diesel generator, but we don’t know how electricity supply will be in Malawi next year. At this moment, we put films flat, and keep them in dark and fresh air, in the condition as good as we can. In Malawi, position, budget and skill share are matching in a good way, so the second phase will be done in a year. Comparing my experiences in three countries, I can say three elements, skills, budget and position are essential for film archiving at least in developing countries. Nobukazu Suzuki was invited by CCJ as part of Professional Exchange Program, supported by the Japan-US Friendship Commission.